Have you seen the recent articles in the news about prosthetic limbs and braces for animals? Or perhaps you saw the Disney movie based on Winter the dolphin with a prosthetic tail. Have you wondered if this is available for other animals? Once considered a novelty, these devices are increasingly available to companion animals too. A recent PBS special entitled My Bionic Pet aired April 9th showcased several veterinary patients. The science of veterinary orthotics and prosthetics (V-OP) is rapidly developing and is solidly based on the same technology once only provided for human beings. There are now specialists in this new veterinary therapy and Colorado is leading the way with a V-OP course offered through the Canine Rehabilitation Institute located in Broomfield. Furthermore research into V-OP is underway at Colorado State University, the University of Louisville, and the University of Florida. Here in Denver at OrthoPets Center for Animal Pain Management and Mobility Solutions we see many dogs and cats and even some llamas, goats, sheep and horses in need of prosthetic limbs and braces. Many athletic dogs sustain injuries to the cranial cruciate ligament (ACL or CCL) of the knee, hyperextension of the carpus (wrist), and rupture of the Achilles tendon among many others. Sometimes these injuries require surgery and sometimes surgery is simply not possible due to other health issues, age of the dog, or financial constraints. Until recently few options existed. Now custom made braces can be used along with surgery or in place of surgery in some cases. Importantly, a licensed veterinarian must provide a thorough examination, diagnosis, and explanation of all therapeutic options. If appropriate referral to a V-OP specialist is the next step, literally. Many dogs are born without portions of their limbs (birth defects), sustain catastrophic injuries or tumors of the lower limbs. Veterinarians are trained to amputate the entire front or hind limb when such wounds are beyond other therapies. While it is true that many dogs adapt quickly to losing a leg, this is functional adaptation and not necessarily the highest quality of life. In fact, as a pain specialist I see some of the consequences of limb loss including chronic neck and back pain as well as breakdown of other joints. Happily, with the new technology of V-OP we can provide prosthetic limbs for these animals so long as 50% of the leg below the elbow or knee can be saved. 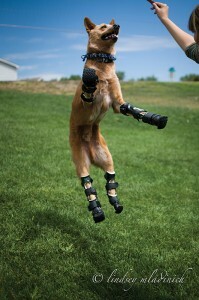 Just like human brace and prosthetic limb patients, veterinary patients receiving these devices are aided in adaptation with professional rehabilitation. With a proper diagnosis, a custom V-OP device, and the right team (your family DVM, an experienced V-OP professional, and a certified canine rehabilitation professional) your dog can take the next step to quality of life and improved mobility.